Community Guests offered a preliminary analysis. Compliments of the Sound Health Portal Team! We wish to help you discover the power of BioAcoustic Biology & Sound Health. Voice Sample quality is completely up to you. Watch the video below to prepare accurate voice files. The Form can be submitted with your voice files, only once. Do your best to capture a quality voice sample for better analysis. Two voice files are suggested. Join the Sound Health Community for free. Use a good USB microphone that plugs into your computer. Watch the video below on suggested Recording Practices. Record and Download two 30-40 second recordings of your voice. Upload your voice files using the form at the bottom of this page. Results will be sent to your email. You may wish to invite a Sound Health Provider to run a closer scan on your voice samples. Note: Once a voice file is uploaded, your voice sample is completely inaudible. Sound Health recommends a number of microphones for capturing a quality voice print. Click the "Shop" button to view a selection of approved budget oriented microphones. 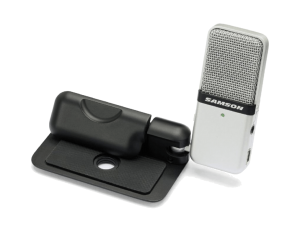 The Samson Go Mic is a popular choice. The microphone and how to use it is probably the most variable yet critical link between your voice and final results. This video presents how to capture voice samples. Create TWO voice samples 30-40 seconds each, MONO 32000Hz. Click Upload Voice Files to send downloaded recordings for analysis. At a loss for words? Then read this when recording your mundane sample. “I suppose you are Real?” said the Rabbit. And then he wished he had not said it for he thought the Skin Horse might be sensitive. But the Skin Horse only smiled. Join the Community to upload voice files.